The latest research from GlobalWebIndex states that Instagram is the fastest growing social media site in the world with a 23% increase in its active user base over the last six months. In terms of overall penetration it still lags behind Facebook, YouTube, Google+, Twitter and LinkedIn which are the 5 most popular social platforms (in that order). 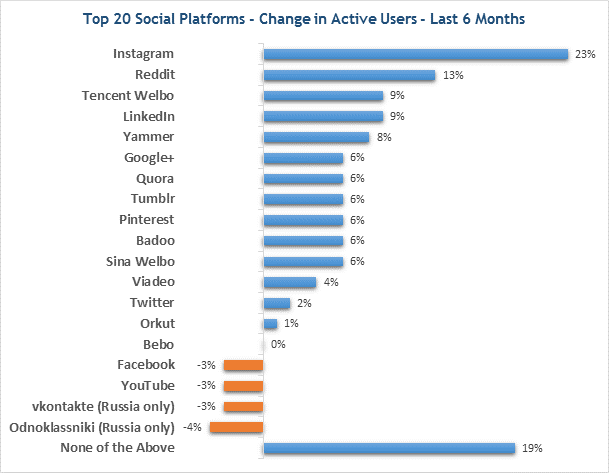 Another interesting insight from the below graph is the fact that Facebook and YouTube have lost 3% of their active users within the same period.